Someone—Bird founder Travis VanderZanden, formerly of Uber—decided it was a great idea to litter the streets of San Francisco with tiny electric-driven scooters. He raised $300 million to put these tiny EVs on street corners. Speaking to a friend who lives in the Potrero Hill neighborhood, this was seemingly a surprise to everyone in the city, “I just woke up one morning, and these scooters were everywhere.” I tried it, and if this is the future of mobility, count me out. Bird is not the only electric scooter startup in the city, either, as an orange-branded Spin has offered identical units to Bird with a slightly different app. The bike-share company Limebike has introduced their own scooters called Lime-S.
Bird is, by a wide margin, the most frequently seen of the three, however. That’s the app I downloaded, and the scooter I used. There is a lot more to this story, however. I was visiting San Francisco for the weekend, spending time with a few friends in the city, when one of them suggested we try out the new scooters. They’ve only been in the city for two weeks, and they’re somewhat controversial for residents. 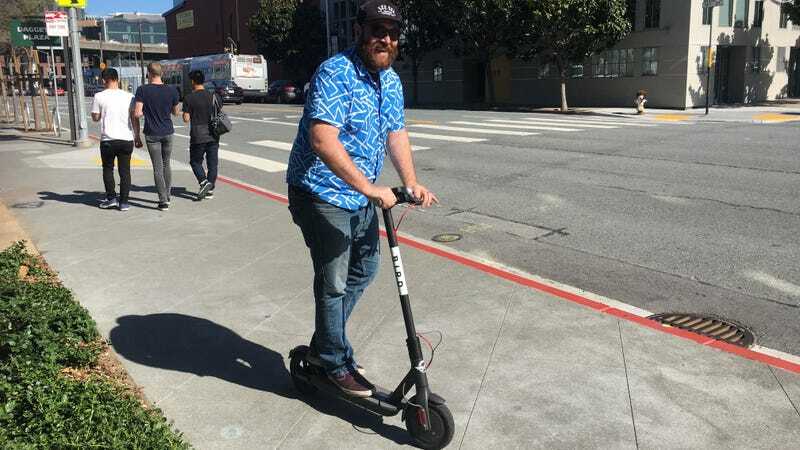 Bird alleges that the city is moving to ban the scooters outright, but the city claims to only want legislation to regulate the use of them. Only two weeks into the experiment, broken and dead scooters seem to litter the city’s walking paths and sidewalks. It sounded like a good opportunity to experiment with a “new” form of transportation, however, and the price of entry was enticing. In their defense, downloading the app and getting signed up was quite simple. I entered my credit card number and took a photograph of the front and back of my driver’s license, and I was cleared to ride a Bird. The app uses your phone’s camera to scan the bike’s QR code, turning it on. If you try to ride one without unlocking it, it’ll beep annoyingly at you. It’ll cost one crisp dollar to fire up the machine, and the app charges you by the minute after that. There were a pair of the scooters sitting right outside of friend Rick’s apartment, so we snagged those and rode over to friend Mikey’s place to pick him up and find a third Bird. We made a plan to ride into the Mission district to get the best burritos in the city at La Taqueria. It’s a three-mile ride that takes about 25 minutes by car, and we figured we could skirt traffic with these little two-wheelers to get there in about the same time. It was a great plan, and it would have worked if the scooters had worked. The problems started from the very first block, as Rick’s Bird did not have strong enough brakes to stop the thing down one of the city’s numerous hills. He managed to Flintstone-brake the scooter a few blocks until we got to Mikey’s apartment, where he quickly traded out for another Bird. In the end, we decided to abandon the endeavor and take a Lyft instead. The thing is, we weren’t the only people looking for an operational scooter. I saw multiple other duos and trios who had secured just-shy-of-enough scooters for their whole travelling party. This, it seems, is not intended to be a socially mobile idea. You can see the path we took, and the cost for the four-miles of riding that I did in the app screenshot below. If the trip had gone off without a hitch, I would absolutely be raving about these startups and their efforts. It’s a relatively inexpensive way to get around town. You don’t have to get stuck in traffic, and the little electric scooters are actually kind of fun to ride. Two of our Birds worked perfectly from start to finish, but finding a third proved impossible. It’s great transportation for one person if you get a good one, but trying to find more than one or two is the real difficulty. If the app were able to give potential riders a notice that the unit they’re walking toward is broken, it would have saved us a lot of time. If the scooters were robust enough to not need serious repair after only two weeks of the company being operational, it would have saved us a lot of time. If the program worked like it was supposed to, it would have saved us a lot of time. At $2,499, Could This Incredibly Low Mileage 1999 Honda CN250 Helix Get You To Scoot?